This sofa is smaller in size great for apartment or loft living allowing you to have stylish furniture without sacrificing important space. Use this apartment-size sofa as a loveseat when paired with a sofa in a more traditional living room setting. The two accent pillows allow you to incorporate another fun color or interesting pattern into the room and complete the look of the sofa. 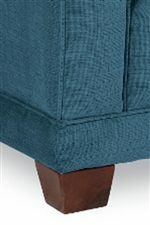 The Kennedy Transitional Apartment-Size Sofa by La-Z-Boy at Conlin's Furniture in the Montana, North Dakota, South Dakota, Minnesota, and Wyoming area. Product availability may vary. Contact us for the most current availability on this product.